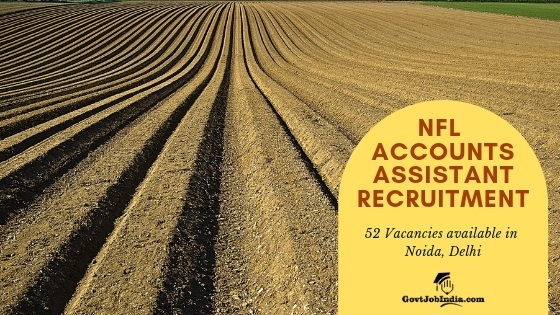 NFL Accounts Assistant Recruitment 2019: Candidates from all over India are invited by the National Fertilizer Limited (NFL) to apply online for Group C Accounts assistant post. If you are interested in this application process then make sure that you send in your duly filled NFL Accounts assistant online application form through the website of the NFL @ nationalfertilizers.com. The NFL Group C Accounts assistant Recruitment is open to all candidates who have completed their Bachelors Degree in Commerce. This makes it the ideal opportunity for all the candidates who are searching for Govt jobs after graduation. Candidates who are selected for this recruitment will be placed in the individual offices of the NFL Bathinda, Panipat, Vijaipur, Corporate Office, Noida and the Marketing department of the NFL. The roles of the Accounts Assistant has been enlisted in the article below. Make sure that you go through this page once before you apply online to get all the details regarding the NFL Assistant Accounts Recruitment 2019. Keep on reading for all the details regarding the NFL Accounts Assistant salary, eligibility, important dates of the recruitment and the detailed accounts assistant recruitment process. Minimum Qualifications B.Com from any government recognized college with at least 50% marks. How To Apply Online For NFL Recruitment 2019 @ apply.registernow.in? Candidates throughout the country can apply online for this recruitment by following the steps provided below, Kindly ensure that you submit the online application form before that last date on 28th February 2019. Visit the official website of the NFL provided above, go to “apply.registernow.in/NFL/ACC“. OR consequently, you can go to the link given below. The link will take you to the official website of the NFL. On the page which comes up, start by entering all your information on the online application form. This must be exactly according to the requirements expressed by the NFL in their notification pdf. Pay the application fee according to your category and submit the form. Save the fee receipt of the payment of the fees and keep it safe. Also, note your recruitment id and save it for further use. All the interested candidates are requested that they grab this opportunity with both hands and secure yourself a job through the NFL Accounts Assistant Recruitment 2019. If you have any doubts regarding the application process, fee structure or the recruitment process of the NFL group C recruitment then make sure that you write them down in the comment section below. We will get back to you immediately. All the best!